This would be a great little list to save to your phone or print and keep in your purse! Anytime you’re out and about check the used book stores and sales racks for some of these great titles! We always meet on the 2nd Thursday of the month! Our GwtW picnic will be an indoor picnic at my house. Please bring a salad to share. See you in a few days!! Thought I’d share this low-to-no-pressure reading challenge! (Did you catch that?… LOW to NO pressure!!) 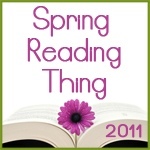 Katrina over at Callapidder Days is hosting a Spring reading challenge (March 20-June20.) I’d encourage you to check it out and maybe even sign up! It doesn’t matter what your reading goal is… 2 books or 20! If you sign up by March 24th you can have a chance to win some Amazon $$! Here are all the details! Let me know if you link up. I’d love to see your to-read lists!! Here’s mine list in case you’re interested: reading goals. PS: Spring is just the perfect time to read, don’t you think?! Windows open, curtains blowing in the breeze and adventures to be had on the pages of your next book! Life can be busy, things change, schedules get scrambled, it happens, so we are making a change in which Thursday of the month we meet. Now we will meet on the second Thursday of the month. The second change is a minor thing. We (the book club core) often has the next 6+ books planned ahead of time. Usually we reveal the next 2 books. Now we’ll keep you in the bigger loop of knowledge. We aren’t the type of book club that requires commitments. You can come whenever you want. Whenever we’re reading a book you like. Or that you have time to read. I’m interested in your thoughts on these little changes. Feel free to leave a comment! Any books you’re excited to see on the list? The Carmel or Downtown locations are probably not too far from most of you, maybe you can go check out the sales and find some of our upcoming book club books! Maybe it’s because we’ve never met in January* before or maybe it’s just because it’s winter in this great Hoosier state… but last night was the first time we had to cancel and postpone a meeting due to weather. Also on a book keeping note, if you’d like to be added to or removed from the Evite mailing list please let me know. RSVP if you can make it! *We usually read a long book for February and take January off. Michelle, one of our members, writes for Modern Handmade Child, an online magazine. In the current Autumn issue she wrote an article about starting a book club called Expanding Your Horizons. You might recognize some of the ladies in the pictures! If you’d like you can subscribe to Modern Handmade Child for free on their website. In other news, our September book club discussion with be the same day and time as usual… BUT we’ll be meeting at Jodi’s house for a fancy dinner party! Watch for more details this week. Sarah was supposed to write a post today to get us thinking about our Shane discussion, but due to some internet issues, she’ll be writing it later this week. In the meantime, here is some literary news that we thought we’d share just for kicks. Our April meeting is just around the corner and is going to be a fun one! First of all, it’s at Tea’s Me Cafe! Second of all, we’ll be revealing May’s book! Third of all, someone in attendance will win a copy of May’s book! Tea’s Me has a great lunch menu (so come hungry!) and a HUGE selection of tea…. even if you think you don’t like tea, I’m betting they can find something you do like! Also, when you email me let me know if you’d like to carpool. Janet will be heading up that arrangement since I will not be able to attend. (*sniff*) I’ll pass that info on to her and she’ll contact everyone and figure out the details of all that.